A few weeks ago my mom and I were talking about "birthday meals" - the dinners that we would always ask her to make for us on our birthday. 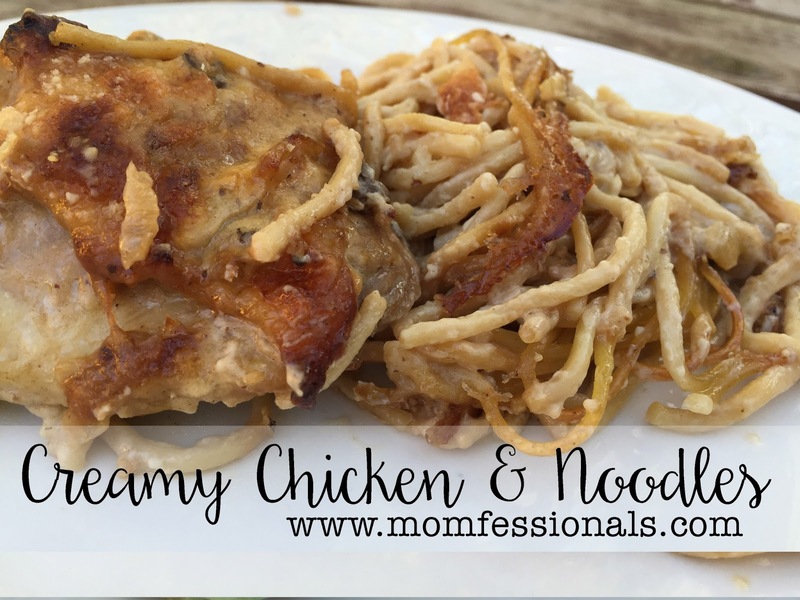 My brother always wanted to go out to eat ribs and every year I asked for her creamy chicken and noodles. 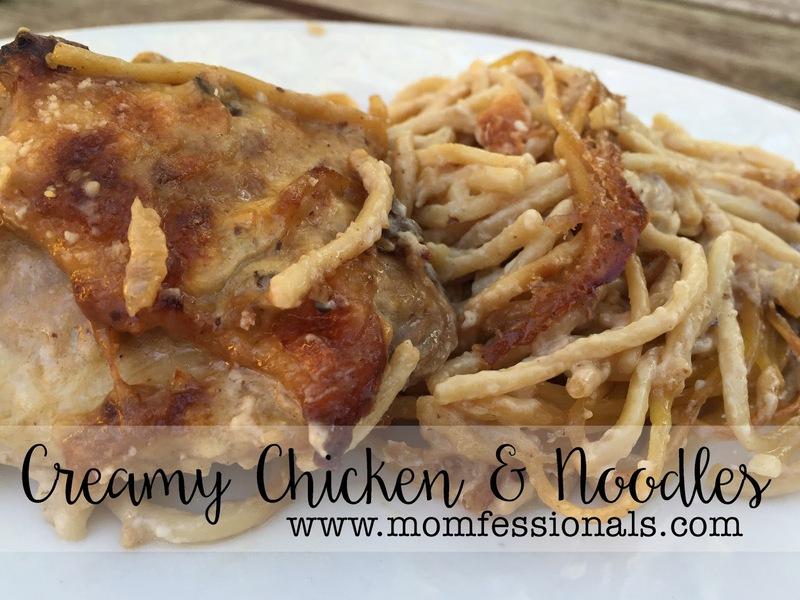 The chicken thighs are AMAZING and the creamy noodles are the perfect side. Step 1 - Saute some onion with garlic and butter until they're soft and translucent. Step 4 - Pour in 1 cup of milk and two cans of cream of mushroom soup. Stir until it's all combined. Step 5 - Put the noodles on the bottom of a 9x13 and then top with the thighs. Step 6 - Throw the sauce on top. Gently mix it through, lifting the chicken and making sure sauce goes under the pieces as well. Step 7 - Sprinkle on some grated Parmesan. Step 8 - Bake uncovered at 350 for 45 minutes. The edges will be nice and crispy and delicious. Step 9 - Serve and enjoy!!! This looks delicious!! I can totally see why you'd choose this for your birthday dinner! Look at how cozy and yummy that looks!! Total comfort food!! I want a big ol' heaping plate full. Right now. Yummy!! This looks deeeee-lish! I think I will be putting this in the rotation next week. Anything with noodles is pretty much always a win! This looks so good, my gang would like this, think I'll add these ingredients to my grocery list and add this to the menu! Um...yum!! I'll be adding that to my menu asap! Looks like another great recipe to add to my rotation, thank you for always sharing such yummy, easy ideas! Can I just say you have the best recipes!!! I've made almost every single one and they are huge family hits. Thanks for sharing them! I always look forward to your recipes, thanks for sharing! I have a pack of chicken thighs & now know what I'm making with them. This looks so delicious! 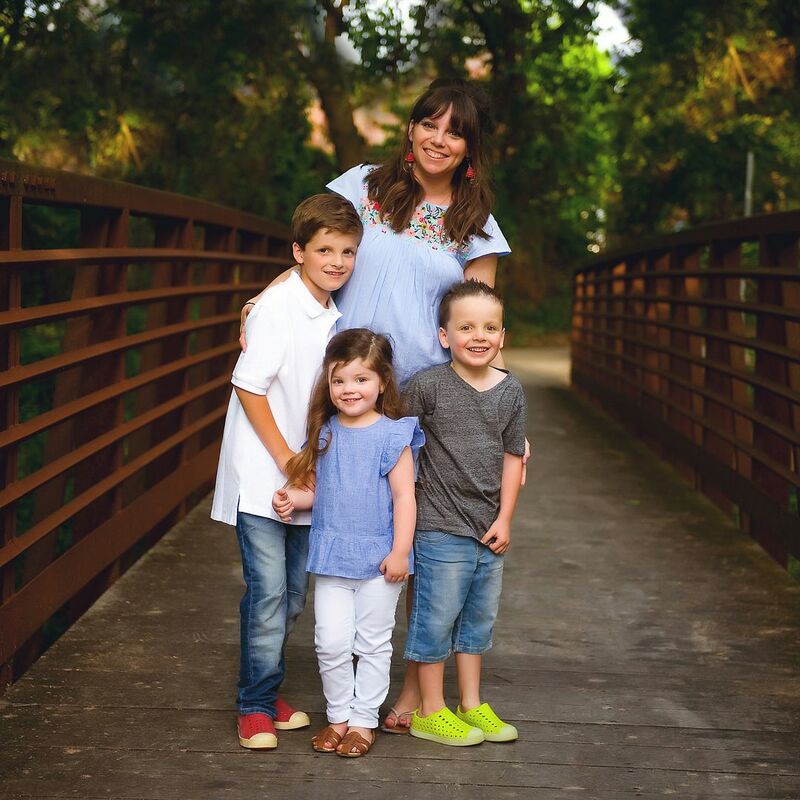 My family loves your recipes! Thanks for sharing! Oh my goodness I cannot wait to make this! You post the yummiest recipes. Aww, my meal was always Chicken Spaghetti, which is really just some chicken, spaghetti, Velveeta and other stuff. Yummy!!! A nice variation of the chicken recipe that calls for the dehydrated Lipton Soup mix and raw rice. I think I will like your recipe better. I do have a question: I am not clear if you used (for flavor) the skin you pulled off the chicken or the skin of the one thigh you left the skin on. Did you ever pull the skin off that one thigh or is there someone in the family that likes the skin left on? Just pulled this out of the oven!! Waiting for it to cool so we can dig in! Thanks for sharing! Your recipes are the BEST! Keep em coming, please!